I read a book on Human Resources recently. It posed the question of whether of not there would be a workforce shortage in the coming years. In fact, more than one book posed the question. In light of the current unemployment rate, automation, the increasing life span and the accompanying need and/or desire to work later in life, the question was a surprise. I’ll even say it, it seemed almost silly in the current atmosphere, but the book did address the issue of a workforce that would work later in life, a “longer living workspan”. The author considered the availability of older workers to fill this expected gap in available employees to be overestimated and used numbers from the United Nations (UN) World Health Organization (WHO) for Healthy Life Expectancy (HALE) to support the argument, saying that though the United States had a long lifespan, it had the lowest workspan in developed countries. While we here in the United States are expected to live longer than people in many countries, we are not expected to spend as much of that time healthy enough to work. There is a gap. As an American I have an interest in the gap and I do not like the expectations at all. This book was using 2001 figures and I wondered if there were more recent numbers. I went to the WHO database website. In fact, there are numbers updated in 2003. This page has a convenient filter on the side so that you can isolate only the countries of interest rather than page through all 191 internationally recognized countries. Not knowing exactly which countries this researcher chose as “developed”, I picked the G-7 nations of Canada, France, Germany, Italy, Japan, United Kingdom and the United States According to the 2003 data the United States has improved the healthy life expectancy a bit, however, we still lag behind all of the other G-7 countries in healthy or working life expectancies and Japan remained on top, improving by a much larger proportion. The HALE expectancy for someone in the US born in 2003 is 71 and the same number for someone in Japan is 78. Let’s put the workforce shortage question aside for a moment and focus on something that I find enormously disturbing. Weather or not I am fortunate enough to be able to retire when I wish, I still want to be healthy enough to work because healthy enough to work is also healthy enough to play. I have been to Japan twice and I love it. What ever they are doing I am likely willing to adopt. So, what is different in Japan and how can I get 7 more years of healthy life expectancy? Stress is known the “silent killer”, but that would not be the difference because they have equal if not greater levels of stress when compared to us. One thing they do have that we do not is widespread public transportation. What difference does that make you ask? In Japan they use the public transportation and that means that they walk. People walk from the train station to home, to the market etc. They also bicycle a lot. In some places there are bicycle garages. Some are even quite large and resemble American parking decks in many ways. Is their solution to commuting the answer to my health question? It could be. There are countless articles and studies from reputable, unbiased organizations showing the benefits of walking. Here is what the Centers for Disease Control (CDC) has to say on the health benefits of walking, or other “moderate intensity aerobic exercise”. The minimum level of recommended exercise is not optional for them, it is built in to every day. That’s not all though, there are compounding effects when using public transportation. When you take Metropolitan Atlanta Rapid Transit (MARTA) you change your carbon footprint and help to increase the number of summer days when Kennesaw Mountain is visible from Stone Mountain and vice versa. You decrease the number of days when ground level ozone is above healthy levels and reduce the number of SMOG alerts. This also helps us to keep our federal funding for road projects, so public transportation even benefits motorists (in more ways than one). Change is scary though and we Americans love our cars. I have had more than one friend who didn’t like public transportation and didn’t want it to be funded or built. One couldn’t even really articulate why, she just liked her Suburban and didn’t want to consider anything else for anyone else. I have argued that one doesn’t need to use public transportation to support it or benefit from it. If drivers could support my ability to have public transportation, I wouldn’t be on the road competing for space in and we would both spend less time commuting, and have an over all lower tax burden per capita. Sometimes working through a change in attitudes is worth the work. So, if you are open to a committed relationship with public transportation what would that be like? It is something I can only dream about. I chose my current home for reasons that at the time were more pressing than access to MARTA. That meant moving into a public transportation black hole, at least as far as commuting into Atlanta is concerned. However, I know people (outside NYC) that do not own, and never have owned a car. One of my grandmother’s never learned to drive. I really thought long and hard about Granny’s decision. It would be easy to see it as a weakness, a disability. My grandmother was born before 1919. In other words she was born into a world that did not consider a woman eligible to vote by reason of gender. She wasn’t weak though. She was really quite independent. In her home town there was a single taxi. She had to plan because there was only the one. If someone was using it, she was out of luck. But she did plan. She went where she wanted to go and had her groceries delivered (from two blocks away). I know someone much younger though, Pamela, who has a committed relationship with public transportation. A friend and former co-worker who is also quite independent, she never chose to learn to drive either. I don’t know if I could be that committed, especially in a country with the limited options we have here in the US. I would need at least one car for the household. Occasionally I just need to get out of the city. Ironically, I need my car to get away from all the cars! But, Pamela doesn’t feel limited any more than my grandmother did. She does what she wants to do, and I’ll admit that there are times when I’m fascinated and a little jealous of her decision. She has no auto expenses. I love the sound of it, No auto expenses! Do you know what that means? The average person (not the high end person) spends a little over $600 a month on auto expenses once insurance, fuel and maintenance are considered. Many companies subsidize public transportation for their employees, but let’s look at the numbers for someone who doesn’t work for one of those companies. Let’s take that over six hundred number down to $500 so that it allows some money for both local and occasional distance travel. What happens when your budget gets a monthly $500 shot in the arm? Let’s say that you were able to save that money and get the proverbial average of 8% return on it. Over a 40 year work life that comes to $1,757,147. Yes, better than 1.7 million dollars. I could give up my car and my lottery habit for that kind of money! Yes, a change could do me good. So to recap, if you have the option and become totally committed to public transportation, you can feel better, reduce health risks, increase healthy lifespan, reduce carbon and other emissions, breathe easier and when it is all done have a big pile of money! It is time for a change isn’t it? I used the savings calculator here if you would like to check your own figures and see what could happen in your own situation. I was doing some internet research yesterday and ended up on the Georgia Organics web page. I checked the calendar just to see if there was anything interesting scheduled. A wild edibles lecture was listed for a different organization, Mushroom Club of Georgia. It had not been two weeks since I had attended a wild edibles hike in a nearby state park. It was conducted by the summer intern and she did a great job, but she was not local and she was still early in her education. I didn’t learn anything and that left me wanting. You never know, you could end up lost and hungry. Russ and I decided to go. The visiting lecturer was Jerry Hightower, a 30 year veteran of the National Park Service and a local who grew up wandering the Chattahoochee River National Recreation Area before it was a part of the National Park System. His lecture was a hum tater. That is a word he used to describe one of the refreshing beverages he was telling us how to make. “What does that mean?” he was asked. “You’re not from around here are you?” he answered, and then he said “Hum tater means that it is good”. And, by the way, I learned that acid content is what makes refreshing beverages refreshing and that there are several things you might have in your own backyard to make one. Ranger Hightower had a great sense of humour and he was so jam packed with information that not even he could remember to say it all. Great questions from the room brought out even more. While the talk was given at a mushroom group meeting, none of his information was actually about mushrooms. He will give another presentation with a walk in the spring and promised to send us an email to let us know when. I’m looking forward to that. The meeting was held at the Central Congregational Church in Atlanta, a very nice setting. Mushroom Club members were friendly and welcoming and there were plenty of well placed signs. The church has a long driveway that forks and other activities were also happening in the building. The signs kept us from needing to ask any questions anywhere along the way. Refreshments were served and there was a specimen table. I’ll definitely be going back. Ranger Hightower had a table full of recommended books. Some of his recommendations are below. He cautioned that some of the books had great information, but were slim on actual identification (a pretty important part huh?). One book in particular had common names and was written from an European perspective, so that some of the common names were not the same as the ones that would be used here. It sounded like the best idea might be to get a few books and use the best parts of each. He said that most of the books were readily available from a number of sources, book stores, Dover. I didn’t hear him say so, but I expect they might also be available at the Island Ford Visitor’s Center. He also had several books by this author, including this one. 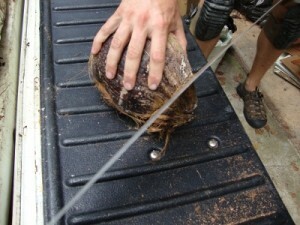 While visiting a friend in Florida we saw a coconut palm with a ripe fruit (called a drupe). We were about to see Russ’ nieces in Disney World and thought they might get a kick out of seeing what a green coconut with the husk looks like, so we asked, and when it dropped we picked it up. We didn’t have any tools though, so while we had an interesting artifact, that’s all it was. We kept thinking about ways to get into it, but without the proper tools we also kept imagining lost fingers. By the the time we got home, the husk was dry and brown. Deciding what to do with it was a bit more difficult. I had seen an entire production in Hawaii with an immature green coconut and a machete. We were driving around the Big Island on one of those roads with the warning signs about the potential for unexpected floods and wondering if there was a surprise waiting in the roadway ahead. 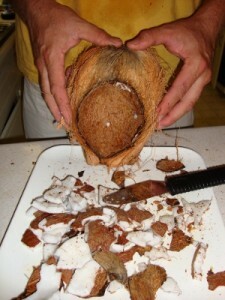 There was, but it was the Coconut King. He had long dreads bouncing off his shirtless shoulders, a Jamaican accent, a song and a machete. It was quite a production and there was no way to watch it all and then choose not to buy the coconut from him. The milk was sweet and the entertainment was a treat. If you don’t have the benefit of meeting the Coconut King, there are plenty of instructions for a green coconut, even video on the internet. 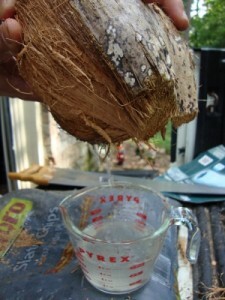 There are also a lot of instructions for how to open a brown coconut that has had the husk removed, but everything useful for what we had, a brown coconut with the thick brown husk still intact required the strong and skilful use of a machete. 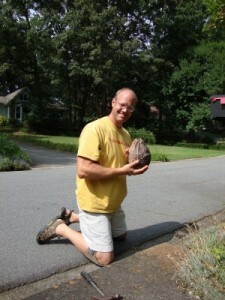 Russ had seen a woman in an apartment complex take a green coconut and beat it on the curb until the husk fell away, so we decided to try that method. It was the safest of all ideas under consideration, but the previously soft green flesh was dried and stringy. You could see the fibers that make planters, door mats and the like very well. 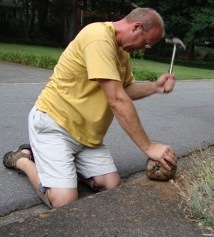 Trying to remove it by curb method was slow going. We were reluctant to take the machete route, seeing those tough fibers. The hammer was on hand so Russ turned it around and used the claw side. That was working much better, but still slow going. One of the demonstrations on the internet used a saw, so he cut off a portion of the end with a saw and started again with the claw hammer. At one point, he was afraid that he pierced the shell and would loose the milk. The eyes appeared to be exposed, so he jumped ahead to the place where you pierce the eyes with a nail and about a cup of milk came out. Then he continued with the claw hammer. Soon much of the nut was exposed and it seemed that breaking it apart and removing it from the husk rather than removing the husk from the nut was the route to take. 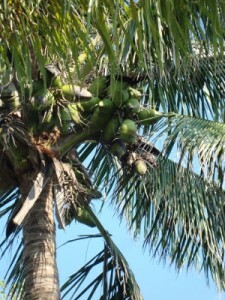 We also got about a cup of coconut meat from this. The meat was very soft and tender, the softest I’ve ever encountered, with a more delicate flavour than dried coconut. Russ’ Grandmother reportedly has the best coconut recipe on the planet and fresh coconut is supposed to be one of her tricks, so we will give it a try and see how it turns out. In the mean time, a friend shared this adult recipe with me. Now this is purely for the purpose of education and by no means a recommendation. Insert all the usual “Don’t try this at home disclaimers” here. Here goes… Apparently torpedo juice (fuel for torpedos) is (or was) very like the Everclear 190 proof beverage that you can get in the liquor store, I’m sure you can see where I’m going with this. A popular coconut treatment when torpedos and coconuts shared the Pacific Theater was to pierce the eyes on a coconut with an ice pick, then fill the coconut with the 190 proof torpedo or human fuel. Then you fill the icepick holes with toothpicks and set it aside. When the toothpicks shoot out of the coconut, your treat is ready. Something tells me that there’s another story here! My imagination runs with all kinds of catastrophe that might befall the person who attempts this with the flying toothpicks and strong alcohol involved. But when “Eat drink and be merry, for tomorrow we may die,” is the prevailing mood, I can see how the risk/benefit trade-off gains a different perspective from the every day life that most of us know. I’ve been very pleased with my tomatoes this year. I haven’t actually been able to produce decent tomatoes in any kind of quantity until now. I haven’t, in the past few years, made the commitment to work on them consistently. 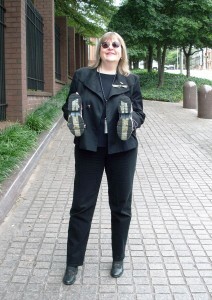 Of course, this is all referencing my time as an independent. Back on the farm, the commitment to work on the tomatoes consistently was made for me, and that work produced killer results. (And, as for quantity, seventy-five plants will definitely produce.) This year I planted my usual two plants (full sun space is very limited at my house), both heirloom varieties. One of them is a Cherokee Purple, which I have grown before, and the other is a Granny Cantrell, which is new to me. I did it right this year. For each plant I dug a two foot square hole, eighteen inches deep. I amended my nasty clay soil with lots of organic matter, and some expanded shale for drainage. The Cherokee was already large, so I was able to plant it all the way to the bottom of its hole. The Granny Cantrell was only big enough to plant about a foot deep. In case you didn’t know you could do this, you can. 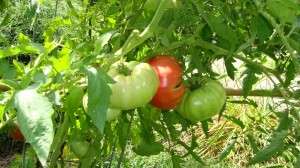 Tomatoes, like most vines, are more than happy to put new roots off any part of the stem that touches the soil. This quality lets you plant them deep, and as a result they will have deep roots which are much more drought tolerant. I also have watered regularly this year, and I use the method my father taught me. The hose is turned on to a mere trickle, and I set it at the base of each plant for anywhere from fifteen to thirty minutes depending on how the soil feels. This method lets the water get deep into the soil instead of just running off the top. The results of my hard work are now becoming evident. I have already harvested more than my last five crops combined, and the vines are covered with future goodness. As an added bonus, this Granny Cantrell, which I just bought on a lark, is kickin’ out some HUGE fruits. 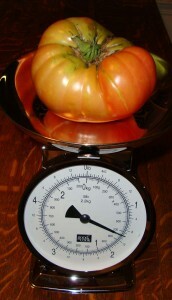 A caveat to the huge fruits- the bigger they are, the more important it is keep the soil evenly moist. Dry followed by wet will produce rapid bursts in fruit growth, resulting in cracking in some cases. The bigger the tomato, the bigger the burst. I went out of town for a few days (no water), and then there was a rain storm, and I have never seen tomato splitting like the Granny Cantrells had. Yes, that's one pound ten ounces. I think Cherokee Purple is still my favorite flavor, but both have been delicious.